within 24 hours via U.S.P.S. This choice is for ADJUSTABLE COLLARS that close with plastic snaps. 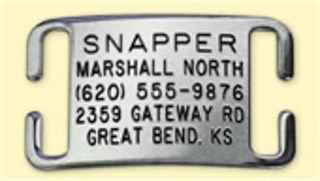 These tags are made of Non-Magnetic Stainless Steel .060 thick and bent to match the curve of your pet's neck. Guaranteed not to fall off of the collar. *Please Note* Mini tags are small and cannot hold a lot of text. Only 4 lines allowed: 14,18, 20, 25 characters will fit. These are the sheepdog herders first choice in dog ID tags for synthetic adjustable dog collars. No noise made to potentially scare sheep or cows. Will not fall off if tugged upon. Because they do not hang, there is virtually no wear. Recommended by Operation Sheepdog Herding for use with synthetic adjustable dog collars.